What was behind Baker’s Chris Christie endorsement anyway? 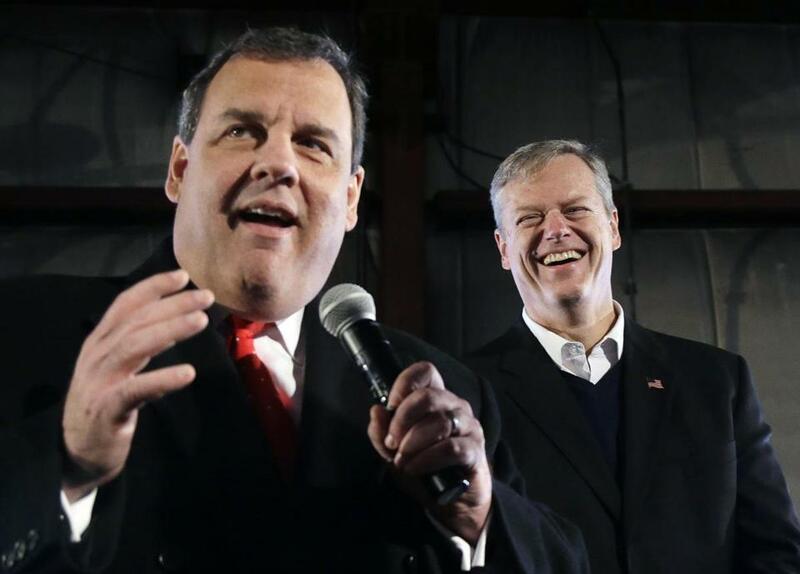 New Jersey Governor Chris Christie and Massachusetts Governor Charlie Baker appeared together at a Christie campaign event in New Hampshire on Saturday. Governor Charlie Baker may be just a bit more calculating and crafty than his budget-geek, Mr. Fixit image implies. That’s the best take-away from his unexpected plunge into presidential politics last week when he endorsed New Jersey Governor Chris Christie. The word out of Baker’s inner circle had for months been pretty strong: The governor was staying out of the often bizarre political turmoil that the Republican fight has become. It seemed to be a safe course, given the right-wing tilt the presidential field was taking. But the best informed sources say he was under heavy pressure to endorse, particularly from a pestering Christie, who could claim some reciprocity for having used the chairmanship of the Republican Governors Association to spend more than $11 million in 2014 backing Baker’s candidacy. Much of that money was likely coming to Baker anyway, because the donors were from Massachusetts. But Christie made sure Baker was well taken care of. But, beyond the money, why Christie? It certainly wasn’t about ideological compatibility. He and Baker have stark differences on the issues — climate change, gay marriage, abortion, funding of Planned Parenthood, gun control. And Christie’s fiscal record is a train wreck: nine downgrades by the bond rating agencies since he took office. His favorability rating among New Jersey voters is barely above 30 percent. And then there’s Bridgegate. And his belligerence is in sharp contrast to the charm that voters apparently find in Baker’s goofy, wonky earnestness. The best guess for the endorsement is that Baker needed to make a political move. First, it helped him cover his base here in Massachusetts, where he could come under fire from the GOP for not being Republican enough. Second, if the eventual presidential nominee is too far from Baker’s own moderate philosophy, he would now have an excuse to sit out the general election. The past relationship with Christie helped. He was the only candidate in the race Baker actually knows. In fact, he donated $10,000 to Christie’s state GOP party account back in 2011 — a contribution that came under scrutiny because of his position with a financial firm whose executives are not allowed by New Jersey law to make political donations to state figures. And it was Christie’s appointed state treasurer who cleared him of any wrongdoing. And what better timing for an announcement Baker did not want to make big headlines — late on a Friday, sandwiched in between two presidential debates, when the media was focused on an out-of-control circus. Even his appearances last Saturday for Christie in New Hampshire hardly got notice. And now Christie is out of the race. And so is Baker. It has to be Baker’s first real cute move since he became governor just over a year ago.